Gallery Living's Terrace 265 is a lesson in clean modern lines and generous use of glass gives a spacious feel to its urban footprint. Despite its slim 7.5m width by 23.5m deep footprint , an abundance of natural light will be drawn into the home via large, wide windows and a well-placed internal courtyard. On the lower level, a modern galley kitchen sits at the heart of the design and overlooks the long courtyard, bringing the outside in and adding to the feeling of light and space. Large sliding doors leading from the kitchen and adjacent dining and lounge spaces (three sets of doors in total) to the alfresco area will make entertaining a breeze all year round and accommodate larger gatherings, whether it be sipping wine on a balmy summer night or sitting around a fire pit in the cooler months. Upstairs there are three double bedrooms, all with built-ins, and a spacious main bathroom with bath. The master bedroom includes an ensuite and plenty of storage, and is cleverly positioned at the back of the home away from the other bedrooms creating a kind of adult retreat, with views out to the courtyard below. 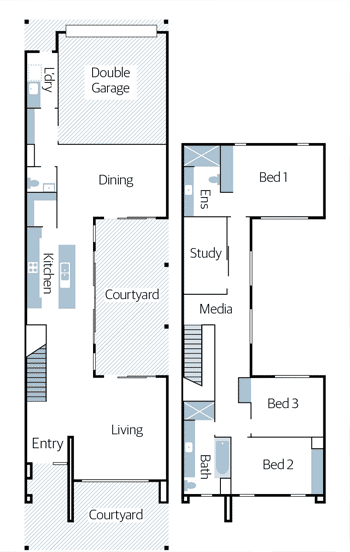 A separate study is a must for professionals and offers flexibility with the floorplan for growing families. There is also an additional media space on the landing upstairs - a light-filled homework zone for kids to get busy on projects. A double garage is positioned at the back of the property, so this design requires rear-lane access, but it means it doesn't interfere with the property's kerb appeal. A space efficient laundry, a wall of storage and a powder room are other inclusions off the garage.